In this post, I will show you the best IPO investment strategy that can fetch astronomical gains to your portfolio. And believe me, you can pick the best IPO to invest in just 5 minutes of your time. But before that, I will suggest you to know how to apply for an IPO? An IPO is the first footstep of any company in the share market. Once the IPO or an initial public offering or a new issue is launched, the companies shares are listed on the exchanges and the investors can trade in those shares and can make profit or loss according to the price rise or fall in the exchanges. How To Make Profit From An IPO? By applying for an IPO and once it is allotted to the Demat Account an investor can hold for medium to long term and sell for a good gain. If the IPO is allotted the investor can sell it on the opening day, if there is good profits – this is called listing gains. Few investors transfer the right to sell an IPO even before allotment of the same and this is done through grey market transactions. Some investors even sell their IPO application forms for some small gains and these applications are sold at Kostak Rate. So in order to make a good listing gain or a massive medium term or long term gains we need to find the best IPO investment strategy. The strategy I am going to discuss can find you the best IPO in 5 minutes of your time. This strategy can be used on the last day of an IPO. What Is The Best IPO Investment Strategy? On the last date of application around 12PM – 1 PM open the IPO’s page in NSE exchange site. Visit NSE –> Products –> Equities –> Initial Public Offerings and choose your IPO. 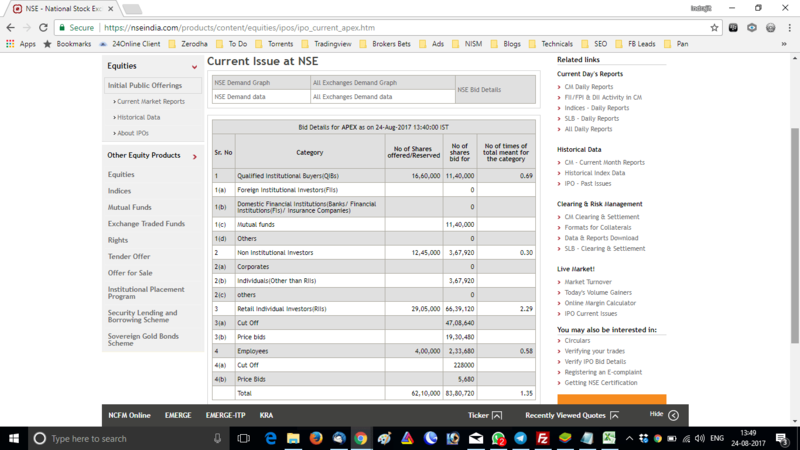 Click on NSE bid details. The IPOs where you will find the Qualified Institutional Buyers(QIBs) are bidding heavily, those are your money multiplier picks and they can give you a decent listing gains as well as they can be held for medium to long terms. Check the bid details few more times and if you find that FIIs and DIIs are bidding heavily for the issue, apply for it. The logic behind my best IPO investment strategy is when Institutional Investors are bidding heavily in the IPO, they have the best research team, the smart money is entering the IPO, so the companies stock price are bound to go up after listing. Today 24th August was the last date of Apex Frozen Foods IPO. Let’s check the bid details. Around 1:50 PM of the last day of Apex Frozen Foods IPO, I have checked the NSE bid details and found the QIBs bid is only 0.69 times of the total available quota. So QIBs are not so interested to apply for the IPO. So we advised our clients to avoid the issue. The issue ended up with a mere 1.91 times bid by the QIBs, so oversubscribed by only 0.91 times. Why I Call This As The Best IPO Investment Strategy? Avenue Supermart IPO was oversubscribed by the QIBs by 104.54 times. The issue price was Rs. 290-299. The stock has made a high of 1019 today, so 3 times gains already within 6 months. BSE IPO was oversubscribed by the QIBs by 24.79 times. The issue price was Rs. 805-806. The stock has opened at Rs. 1085 and made a high of 1194 on the opening day itself, so the investors enjoyed a decent 30% listing gains. Thanks for such a nice details about IPO . SME ipo are not reflecting here in this? Harshili, very good question. In fact I am also searching the SME exchanges for allotment data of last day. Will update if I get any link of the same. Till then this strategy works very well in NSE exchange.